The European bearded iris species Iris aphylla has contributed to the development of modern bearded irises in a number of different ways. It still remains of considerable interest to hybridizers, particularly those working with the median classes. The species is native to much of eastern Europe, with a range extending farther north than other bearded species. This makes it thoroughly winter hardy. It goes completely dormant in winter, losing all its leaves right to the ground. (The Latin word aphylla means "leafless".) The flowers are violet, although some recessive white and other off-color forms exist. The flowers themselves are not particularly glamorous, being often narrow and of poor substance. One of its most distinctive characteristics is prolific basal branching, with long branches starting low on the stalk, not infrequently at the point the stalk emerges from the rhizome. It varies in height, with forms as small as 30 cm and as tall as 60 cm or more. Both wild-collected forms and garden cultivars of the species have been registered and circulated. Happily, I. aphylla has a similar chromosome complement to that of our modern tetraploid tall bearded (TB) and border bearded (BB) irises. This means it can be crossed with them to produce fertile seedlings that can be continuously worked with and improved for as many generations as one likes. Early breeders showed little interest in medians, and simply worked I. aphylla into TB lines. 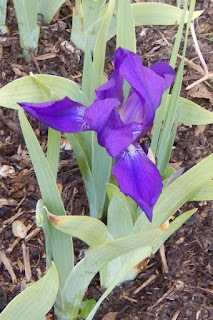 It was found to contribute two interesting traits: an intensification of violet flower color, and blue or violet beards! Many early approaches to black in TB irises, such as 'Sable' (Cook, 1938) and probably 'Black Forest' (Schreiner, 1948), derive from I. aphylla. 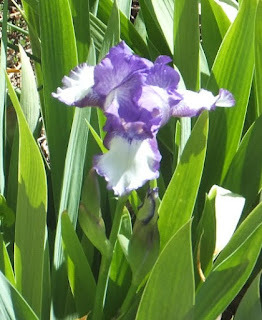 It is also behind many whitish or light blue TBs with blue or violet beards. 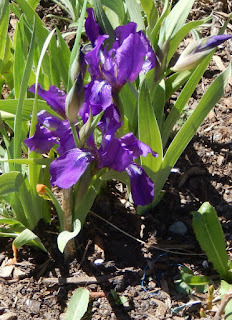 In these irises, the dominant white found in TBs interacts with the intensification of violet pigment from I. aphylla. 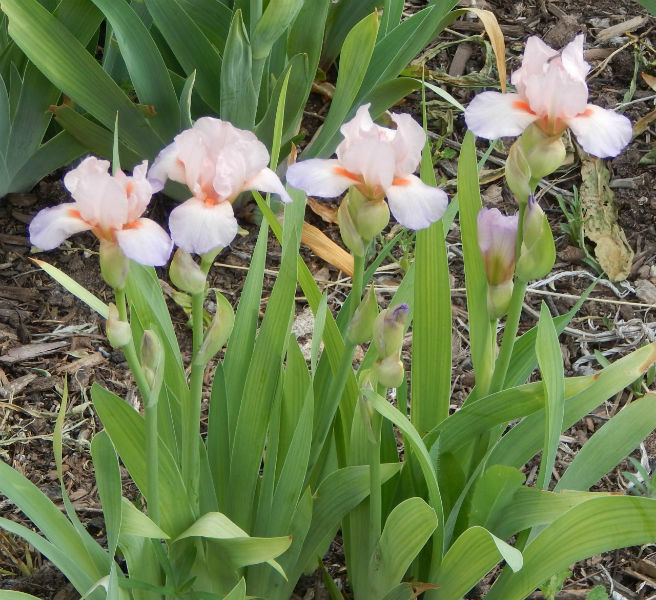 When enthusiasm for median irises blossomed in the 1950s, with the formation of the Median Iris Society and the establishment of the four classes of median irises, creative breeders began to consider the potential of I. aphylla to add variety to these classes. The most ambitious of such undertakings was Ben Hager's project to create tetraploid miniature tall bearded (MTB) irises. This class had been created with diploids in mind. Most TB irises from the 1800s and early 1900s were diploid, with a daintiness that was lost when tetraploids came to dominate. Early MTB breeders had taken these daintier TBs and bred them for even smaller size and greater delicacy. The MTBs were promoted as subjects for flower arranging. Tetraploid TBs, however, showed more different colors (such as tangerine pink), wider form, and better substance. Could these traits from the modern TBs be transferred to irises dainty enough to qualify for the strict requirements of the MTB class? Hager set about proving that they could. He crossed I. aphylla with small TBs and BBs, and then kept breeding toward the MTB requirements. After many generations of work, he established a line of tetraploid MTBs. Although these did not look exactly like the diploid MTBs (I. aphylla yields straight, upright stalks with vertical branching, whereas diploid MTBs often have a more zig-zag branching style), they had an appeal all their own. The first pink MTBs were Hager's tetraploids from I. aphylla. Hager's work was carried on by Jim and Vicki Craig, who combined Hager's irises with their own crosses involving different forms of I. aphylla. They introduced not only tetraploid MTBs, but BBs and IBs from the same breeding lines. This enhanced the variety of all three classes. They even produced a couple that were small enough to qualify as standard dwarf bearded (SDB)! Others have worked with I. aphylla over the years, and continue to do so. Some hybrids that a relatively close to the species itself have been registered in the SPEC-X category. Paul Black's "small-flowered TBs" owe a debt to I. aphylla. This species has contributed a great deal to the variety we find in both TBs and medians today. Do you grow any irises with I. aphylla ancestry? I'd wager you do!